FOOD MATCH: It’s more a lightweight quaffing wine than a wine for food, but in experimenting with snacks we found its light bitterness made it a good companion with roasted almonds. Avoid cheese, though, which due to its fatty character seems to heighten the wine’s bitter edge by cloaking the sweetness and acidity. WHEN TO DRINK: This is not a keeper. The 2017 is on the market for a reason. Enjoy it over this summer, then watch for next year’s vintage. My local price is in line with Wine-Searcher.com’s $14 average retail. It’s a fun wine, certainly worth the toll for me. Click here for the importer’s fact sheet on Cantine Montagna and its Sangue di Giuda. Wine-Searcher.com returns only limited vendors for Cantine Francesco Montagna Oltrepò Pavese Sangue di Giuda on Wine-Searcher.com. You might check in with the importer via its online contact form for information on retailers accessible to you. 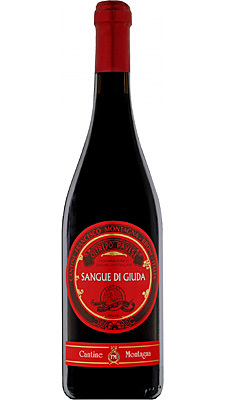 Try this Wine-Searcher info page on Sangue di Giuda, though, for a list of about two dozen bottlings from other producers.